Sen. Thad Cochran (R-MS) lives in the basement apartment in a house owned by his executive assistant, Kay Webber, which he has listed as his primary address on official forms. 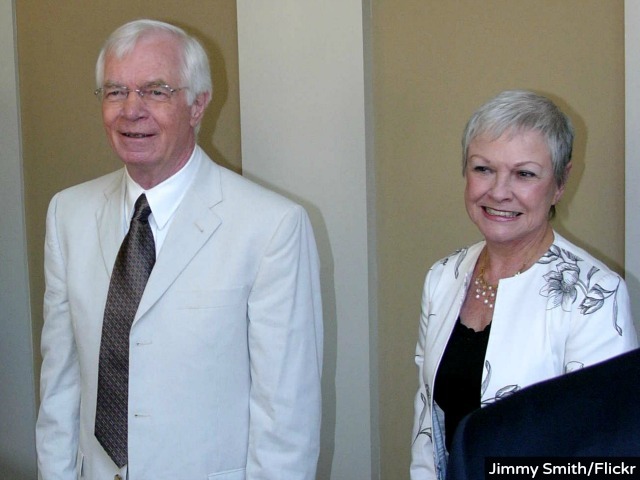 Now public records show Webber accompanied Cochran on dozens of taxpayer-funded trips overseas. According to the Congressional Record, where trip details including cost are listed, Webber has traveled with Cochran at taxpayer expense to 42 countries across five continents since 2002. For example, Cochran and Webber traveled eight times to France, five times to Italy, four times to Israel, and twice to Japan. Other documents show that in 2005 and 2007, the Wine Institute, a trade association that represents the California wine industry, paid for Cochran’s and Webber’s travel to Sonoma, California for what a disclosure form described as “a fact-finding program on issues of importance to the wine industry.” No other aides attended the trip. The Congressional Record lists 33 trips that Cochran and Webber attended together. According to that record, the cost to the American taxpayer of Webber’s travel was at least $155,000. Cochran staffers attended many of the trips with him and Webber, as well. For example, Stewart Holmes, who works at the Senate Appropriations Committee for Cochran and formerly advised him on intelligence and national security issues in his personal senate office, attended 16 of those trips. Senators routinely bring their spouses and aides on the taxpayer-funded trips, called congressional delegations or “CODELs” in Capitol Hill parlance. However, on many of the trips that Cochran and Webber went on, the other aides who traveled with their bosses had specialized expertise or worked primarily on foreign policy issues. “It’s a little unusual,” said Bill Allison, the editorial director of the Sunlight Foundation, a government watchdog group. “It looks peculiar,” added Tom Fitton, the president of Judicial Watch, another watchdog group. “We’ve investigated these CODELS and many tend to be wasteful junkets, so it is fair to ask about any frequent fliers,” he added. Cochran’s campaign says Webber, who began working for Cochran 33 years ago in 1981, performs senior responsibilities in the office that belie her title as just executive assistant. Jordan Russell, a spokesman for Cochran, said Webber responds to constituent requests, helps Cochran maintain his schedule, coordinates travel, staffs his Capitol office, periodically organizes events for constituents and groups of Senators, and participates on conference calls with other senior aides to offer strategic advice. “Ms. Webber is a senior member of Senator Cochran’s staff with more than three decades of experience on Capitol Hill. It is appropriate for a senior member of the Senator’s staff with her Congressional experience to accompany him on these trips,” Russell said. Although Congress somewhat cracked down on lobbyist-funded travel after the Jack Abramoff scandal in 2006, the list of taxpayer-financed trips that Cochran and Webber have participated in highlights a congressional perk that is alive and well: CODELs. Lawmakers and aides have long defended the trips as important for research and fact-finding. However, government watchdogs have just as vigorously criticized the trips as wasteful junkets. Documents obtained by the Wall Street Journal, for example, show how a 2008 trip to Egypt, Jordan, Iraq, United Arab Emirates and Spain, show the group of senators and aides expensed $750 in bottles of wine purchased before the trip at an Arlington,VA vineyard. Cochran and Webber attended that trip. The trip’s list of attendees illustrates that on many of the trips, Webber was in the company of aides that had job titles different from hers. A document listing the participants says Sen. Sheldon Whitehouse (D-RI) and former Sens. Byron Dorgan (D-ND) and Kent Conrad brought their wives. The staff included Holmes, described as Cochran’s military legislative assistant, or “MLA” for short, Brian Moran, Dorgan’s MLA, and Dennis Kellecher, Dorgan’s chief counsel. Webber was simply described as “Sen Cochran’s staff” and then carried the title executive assistant, as she does now. In media reports and other documents that occasionally surfaced her name in past years, Webber was described as someone who “organizes social events” for Cochran (1989), a “receptionist” (1992), and “staff assistant,” none of which are commonly used to describe senior responsibilities in a congressional office. In at least some instances, other senators authorized staff with similar titles to Webber’s to travel on CODELs. For example, Anne Caldwell, Sen. Richard Shelby’s executive assistant, also traveled on seven of the 33 trips that Cochran and Webber went on. Karen P. Brown, Sen. Mike Crapo’s (R-ID) executive assistant, attended a 2013 trip to Colombia, Argentina, Chile, Brazil. However, in the significant majority of cases, aides that attended trips had titles like chief of staff, legislative director, professional staff member (a title given to committee policy aides), legislative assistant, and so on. Cochran, who is locked in a tough primary election battle against Mississippi state senator Chris McDaniel, recently faced criticism from McDaniel for listing his primary address on official documents, including several of his statements of candidacy to the Federal Election Commission, as the house owned by Webber – and not the cabin he owns in Oxford, Mississippi. He also faced questions about the financial arrangement he has with Webber to rent out the apartment, which Russell said has its own separate entrance from the main house. On her personal financial disclosure form for 2013, Webber said she received between $15,000 and $50,000 in rental income from the apartment. Webber also rents the first floor of her house as a venue for fundraisers, for which she said she received between $15,000 and $50,000 in income from in 2013. Indeed, invitations for fundraisers held by Republicans and Democrats have listed the house as a venue. For instance, Rep. Sheila Jackson Lee (D-TX) hosted a barbecue-themed fundraiser there in 2008. Rep. Charlie Rangel (D-NY) hosted a reception there in 2006. Webber has also been photographed with Cochran at numerous black-tie events in Washington, D.C. For example, one photograph shows the two of them at the self-described “star-studded” Kennedy Center Honors gala, and another shows them posing with movie star Richard Gere. Cochran’s daughter was photographed with him and Webber at the PEN/Faulkner gala honoring fiction writers at the Folger Shakespeare Library on Capitol Hill. Cochran is married to Rose Cochran, who resides at a retirement home in Madison, MS. According to the Madison County Journal, she suffers from severe dementia. A Dec. 18, 2002 article reported that Rose Cochran had been a resident of St. Catherine’s Village in Madison for two years. Staff: Dr. John Eisold, Serena Hoy, Mike Castellano, Kay Webber, Federico de Jesus, Marcel Lettre, Anna Gallagher. Staff: Charles Houy, Stewart Holmes, Elizabeth Schmid, Brian Potts, Jenny Wing, Anna Caldwell, Kay Webber, Lula Davis, Dave Schiappa.